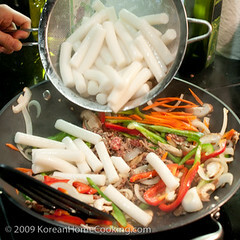 In Korea, tteok bbok kki is almost synonymous with 'street foods' or 'cheap foods'. It's needless to say that tteok bbok kki is the No. 1 best selling street foods. However, tteok bbok kki's original form and the context it was served in the past is quite different from what we see on the street carts in Korea today. 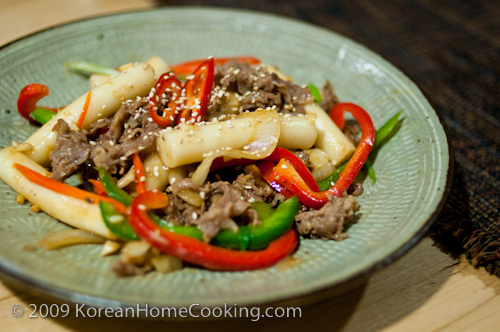 Back in the old days, tteok bbok kki used to be an exclusively royal cuisine cooked with slices of beef, shitake mushroom, and a mix of colorful vegetables in soy sauce base instead of chili paste. Since red chili was not introduced to Korea until the early 1600s, the spicy tteok bbok kki we know of today is a relatively modern creation considering the 5000-year-long Korean history. It appears that when the red chili was introduced to Korea, people simplified what was a luxury royal cuisine into a commoners food with red chili sauce and slices of fish cake in place of beef and fancy vegetables. This royal tteok bbok kki doesn't have the Korean spicy kick, but you get to enjoy sweet soy sauce taste and crispy vegetables. 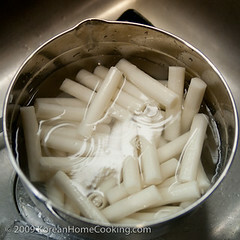 Soak rice cake in water for 10+ minutes. 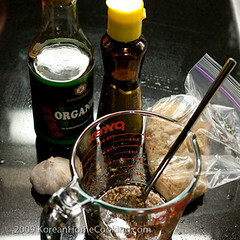 Prepare the sauce by mixing minced garlic in soy sauce, sesame oil, brown sugar. 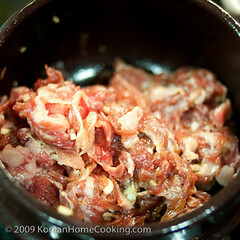 Marinate beef for 30 minutes using half the sauce from Step 3. Bring the rice cakes from Step 1 to boil and drain. 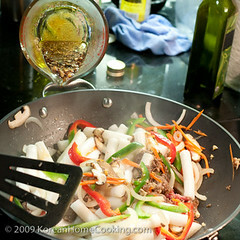 In a wok or a pan, stir fry the marinated meat from Step 4 and the vegetables from Step 3. 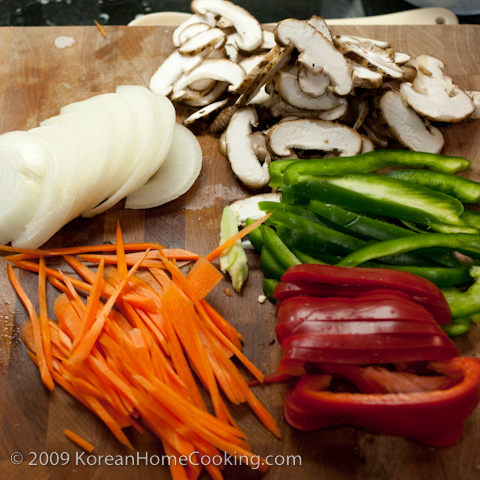 When the meat and vegetables are about half cooked, add the rice cakes from Step 5. Add remaining sauce from Steps 3 and 4, and stir fry. Sprinkle some sesame seeds on top before serving. Oooh, that looks delicious. I've only had the spicy kind, so thank you for the recipe! I'll try this soon. I wonder if you could post a recipe of the brown sauce that comes with instant noodle. I really like that sauce, but never got the recipe. @Renee - I personally like the spicy kind better, but this is a must-try if you haven't. Interesting. This looks like a different version from what I have known. I like the way you prepared the sauce. It looks so simple. I recently tried like this hot version: http://spoon-and-chopsticks.blogspot.com/2010/08/korean-hot-and-spicy-rice-cake-dduk-bok.html. 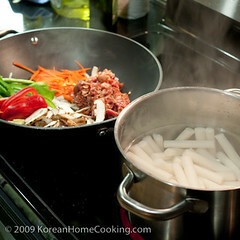 @Spoon and Chopsticks - There are many different versions of recipes out there for ttuk bbok kki. I am sure they are all good. Thanks for sharing your link.